Five years ago I discovered the most awesome of awesome Sharon Shinn. I'd been walking past Archangel in the bookstore for ages at that point and passing it up every single time because of the cover. (Will I ever mend my cover snobbery ways??) I remember it was a recommendation by a very trusted Readerville friend that finally pushed me over the edge into buying a copy and giving it a shot. I didn't get past the first page--no, the first line--before falling irrevocably in love. The angel Gabriel went to the oracle on Mount Sinai, looking for a wife. The world . . . such a world she creates in that book! And, as I've told you many a time, she is no slouch in the character department either. Rachel and Gabriel are as beloved to me as any characters I've ever read. They're so real to me they transcend the barrier between book and reader. At the time I had no idea it was actually the first book in a series--the Samaria series. Upon finding out, I immediately dashed to the bookstore and purchased books two and three and glommed my way through them as well, barely pausing to catch my breath despite the fact that hundreds of years passed in Samaria between each book. Then a fourth book--a prequel of sorts--was published and I had the pleasure of finding out what the world was like a couple of hundred years before Gabriel and Rachel walked it. And then I heard tell of a fifth book coming out. And when I heard when it took place and who the main character was, I knew it would rock my world. 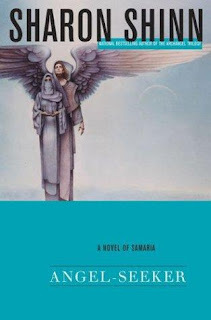 Angel-Seeker follows a dear friend of Rachel's--an angel by the name of Obadiah who, for various reasons, was left a bit at loose ends at the close of Archangel . This fifth book was to be his story and, believe me, it is impossible not to love Obadiah. And his story lived up to every expectation I had. Published last of the lot, it often feels to me like some readers never quite make it to this installment and that is such a shame because it is top notch stuff and my second favorite after Archangel . It was when I read Holly's review of it over at Book Harbinger that I knew it was time to feature it for a Retro Friday post. Obadiah is spoiling for a fight. He's restless at the Eyrie, which has always been his home. He doesn't fit in at Cedar Hills, despite his loving friends who only want the best for him. And to top it all off, he's still carrying a pretty strong torch for a woman he can never have. Then the Archangel himself calls him into his office and sends him on a mission to the last place Obadiah wants to go--Breven. The home of the Jansai merchants, Breven is a bit of a lion's den when it comes to angels. But Obadiah has always had a way with people. Blessed with a light heart and a clever tongue, he is literally the kind who finds music wherever he goes. And since the alternative is throwing himself off a cliff from despair and boredom, he agrees to the Archangel's demand. And for awhile things go fine. But on his way back to Cedar Hills something goes badly wrong and he is stranded in the desert, where a young Jansai woman named Rebekah finds him. Despite the rather large taboo against talking to men outside her family, let alone brazen angels, Rebekah nurses Obadiah back to health and a connection is formed that will spell both the heights of happiness and the depths of danger for the young woman and the angel. Interwoven with their story is the tale of a poor young woman named Elizabeth who makes her way to Cedar Hills in search of an angel to father her a child and thus secure her lasting comfort and safety. Angel children are rare and much prized and Elizabeth is nothing if not practical and determined. And so she leaves the obscure farm she lives on for the big city and the elusive freedom that just may await her there. These two stories interweave in unexpected and very complimentary ways and--as is always the case with a Shinn book--I'm surprised that I am perfectly content to love the ones I'm with, if you will. I look forward to each alternating chapter, to finding out what's going on with the Rebekah and Obadiah and then Elizabeth and her struggles to find the life she's so certain she wants. What constantly amazes me about Sharon Shinn is that she consistently crafts equally strong female and male characters. They call out to me in spades as they are so finely matched in strength of character and determination. I worried so much over how Obadiah would fare out on his own, without the friends he loved. But then he met Rebekah and all the little pieces fell into place. Nothing was easy, but when they were together it felt right and not like it was manufactured just to finish out a side character's story arc satisfactorily for longtime readers. What a blessed relief that is! Their relationship develops in an incredibly sweet manner, unfolding slowly against the backdrop of discrimination and fear that surrounds their two peoples who have been at each other's throats since time immemorial. Because of the nature of their interactions, everything is played out in little snatches of time, brief moments in which they are able to be together. There is quite a lot of tension, but none of the resentment and barely suppressed anger that characterized Rachel and Gabriel's tumultuous relationship. These two are different and very much their own characters. Often in books like this, one storyline out shadows the other, but seemingly terminally single minded and heartless Elizabeth completely grew on me. She grew and became both harder and smarter and gentler, which is, of course, a combination impossible for me to resist. Last but not least, there are just the right amount of glimpses of old favorite characters sprinkled here and there to put a smile on my lips and remind me why each book in this series is a delight and why I will be reading them over and over again all throughout the years of my life. Highly recommended for fans of romantic fantasy and strong world-building. Oh, I'm SO in! How have I never heard of this series? Angie, what's your recommendation on where to start? Angelica? Or Archangel? i swear i havent heard of like 90% of your retro friday books, and this makes me feel like there is a huge gaping hole in my reading history!!!! i loved your whole review, but when i got to your last line i knew it was for me! sign me up for any romantic fantasy with strong world-building! Oh Angie you have a way with words. My reviews always pale in comparison. Naturally I agree with all you said. I hope more readers will pick this up because of your review. Will I be totally lost if I read this out of order? Kati, awesome!! Definitely start with ARCHANGEL. Then move right on to this one. That is my educated opinion. lol. Tina, well put. *grin* And yay for your own RF post!! I loved it. danya, indeed. There is no not loving Gabriel. Such thing doth not compute. Emily, I avoided it for the same reason. Thought the religious aspect would be too heavy handed. But it really, really isn't. ARCHANGEL was the ultimate surprise for me. The entire series is the stuff of comfort reads. Charlotte, lol. Yup. I think you would find yourself pleased as punch with this one. The whole series, really. Tiah, the only strong feeling I have on the matter is that you should read ARCHANGEL first, followed by ANGEL-SEEKER. That really sets the stage best. The rest is totally up to you. Sharon Shinn is a favorite author and Angel Seeker is one of her best. Her writing made the love story between angel and Jansai woman vivid in my mind. More people should really discover her Samaria series: just the right mix of romance, political intrigue, and cultural complexities--set in another world. By the way, I also have this cause to blog about older books on YA Fantasy. I actually prefer them over the current ones in the genre. I really liked Angel-Seeker, too. I was so frustrated when the second book came out after Archangel and it had jumped forward in time--I wanted to find out what happened to all my favorite characters from Archangel! And Obadiah is teh awesome. I love love love this series! Definitely an all-time favorite. I found it as a kid and Shinn's world has stayed with me ever since. I LOVE this series, but I have to say I was a little disappointed when I started the Thirteenth House series. It seemed canned after the Samaria series. Does the Thirteenth House series get better after the first book? The Samaria novels are definitely in my top 5 favorite series of all time, partly because the settings is so wonderfully presented, and the characters are so realistic - but also, I just love Shinn's writing. It just flows so easily. ArtSeblis, agree on people needing to discover the Samaria books. They are just excellent. Chachic, I'm so glad it is! She is definitely the only author I've read to have handled the angel genre at all well. Read the Book, okay, this is coming from someone who adores MYSTIC & RIDER, but I have heard from people who felt similarly to you that they do think the series gets better with each book and thoroughly enjoyed the rest of them. So if you haven't read THIRTEENTH HOUSE or DARK MOON DEFENDER, you should probably give them a go to see how it fares for you. I just love that group of companions and getting a story on each of them was so fun. Sunny, see? There you go. They do get better even if you didn't fall hard for the first one the way I did. And I agree. Top 5 for sure. Thanks, Angie! I will try them again!